Egg: A butterfly starts its life as an egg. 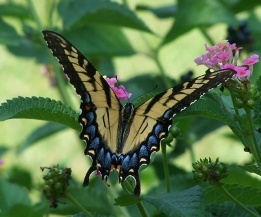 The female Tiger Swallowtail butterfly lays its spherical, yellow-green eggs on a leaf high in a tulip tree, sweet bay, wild black cherry, ash, lilac, aspen, birch, or choke cherry. 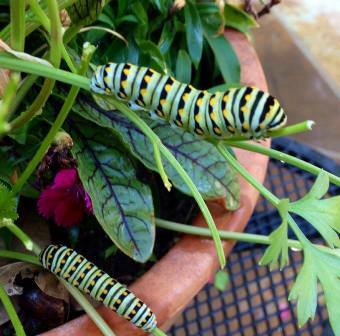 Caterpillar: The larva (caterpillar) hatches from an egg and eats the egg shell. Then it eats leaves (almost constantly). The newly-hatched larva is brown and white, and looks like bird droppings, but it turns green later. The caterpillar loses its old skin many times as it grows. 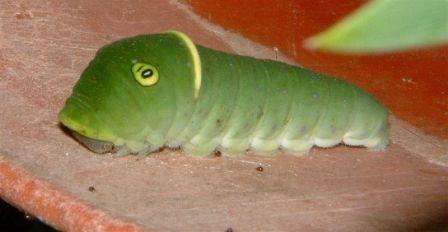 The caterpillar is plump, smooth, and green with large yellow eyespots" that have black "pupils." There is a yellow and black stripe where its "neck" should be. It grows to about 2 inches. Adult: A beautiful, flying adult emerges. 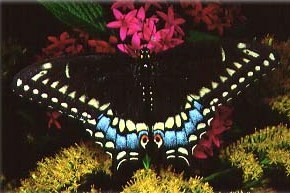 There is no growth during this stage, but the butterfly will sip nectar. This adult will continue the cycle by reproducing. Females produce two broods in the north, three in the south. Wings have distinctive yellow and black stripes. 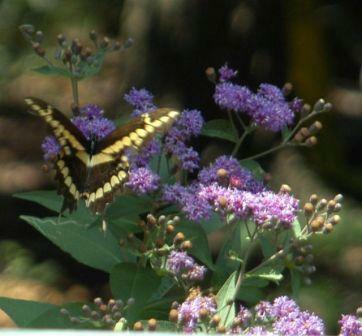 Some females (especially in the south) are much darker, mimicking the poisonous Pipevine butterfly.